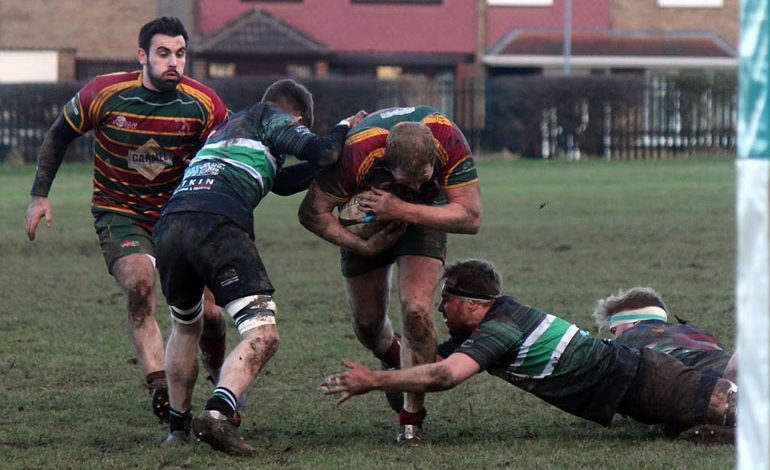 The First XV travelled to Teesside and to league leaders and all but certain league winners, Acklam. Given the difference in recent form, there was little expectation on Aycliffe, and missing a few key players the First XV were free to be a bit more creative with their rugby. The game started poorly, as has so often been the tale this season for the First XV, with Acklam crossing within the first minute, a mismatch in numbers in the Aycliffe defensive line forcing players to come in and cover tackle, leaving Aycliffe’s winger man for man on the outside centre, giving the home winger a clear run in. The only positive for the visitors was the home side’s kicker who was unable to convert, keeping it to seven. Instead of shaking off and numbering up, Aycliffe continued to play the same defensive shape, gifting the overlap to Acklam, three more times in quick succession. There were some positives to be taken from the defensive performance, with individual tackles from Ben Walton who returned to the 9 shirt for the first time this year, James Thacker and Jeff Hodgson all showing real intent, their efforts were not enough to stem the flow of tries as a further three came in the following fifteen minutes, all of which were converted. The record remined unchanged for the remainder of the first half, as time and again Aycliffe found themselves outnumbered on the wing, or individual missed tackles allowed the home side to cut through and cross. The many Aycliffe fans who had made the trip across, headed into the bar at half time in search of a strong drink, and fearing a cricket score was to come. Aycliffe returned to the field almost a different team, no changes had been made, but the attitude of the squad that began the second half was the polar opposite of the half that had preceded it. Despite spending the first fifteen minutes of the half in complete control and almost exclusively in the Acklam half, Aycliffe failed to execute at the last stages of their attacks, either giving penalties or ceding possession through poor ball control, which saw Acklam go the full length twice, taking them to almost seventy to nil. However, the visitors reapplied the pressure, forcing the defence back through hard carries from the whole squad, with centres pairing with flankers and locks with wingers, all carrying hard to make well earned metres and press on towards the white line. On the five-metre line Aycliffe lost possession to a questionable turnover, but managed to regain control as inside centre Lewis Stephens read the play, taking the intercept and crossing to give Aycliffe their first points of the game and deserved degree of pride. Acklam struck again twice, profiting from poor one-up tackling and crossing twice to take them over eighty points. Despite a further few good phases of attacking play, Aycliffe were unable to capitalise and take any further points. This result sees Aycliffe remain second bottom, tied on points with demotion rivals Winalton Vulcans, and four points behind Richmond but with a game in hand to both. Richmond also lost their fixture, and given their much tougher run of games to the end of the season, may see the First XV leapfrog them and stay up in DN2.